The Universal Kraftwerks Performance High-Velocity Intake Kit reduces heat soak and maximizes airflow and velocity on any induction system. The kit utilizes a massive 6.8” diameter high-flow low-restriction air filter that features a unique double-cone design. The inverted inner filter cone not only increases the filter surface area and air flow capacity, it also helps reduce turbulence inside the filter and guides the incoming air to achieve higher flow rates and velocities. 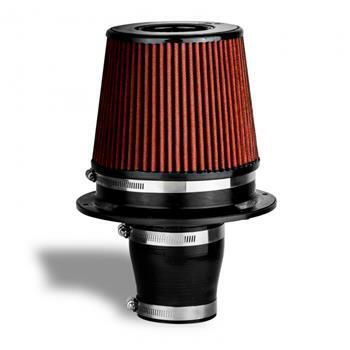 Included with the filter is a unique Composite Velocity Stack that incorporates golf ball like dimples on the surface that create an energized boundary layer that reduces surface drag and allows air to stay attached as it curves into the bell mouth. The result is higher air velocities and increased air mass delivery to the engine. We flow tested a conventional air filter design against the Kraftwerks Performance filter and advanced CFD analysis showed our filter flowed 20% more air-mass, which translates to significantly less restriction on the engine.